Day Five of our week away was predicted to produce a shower in the afternoon, but this did not eventuate and we were left with yet another day of perfect walking conditions – about 22C and a light breeze. 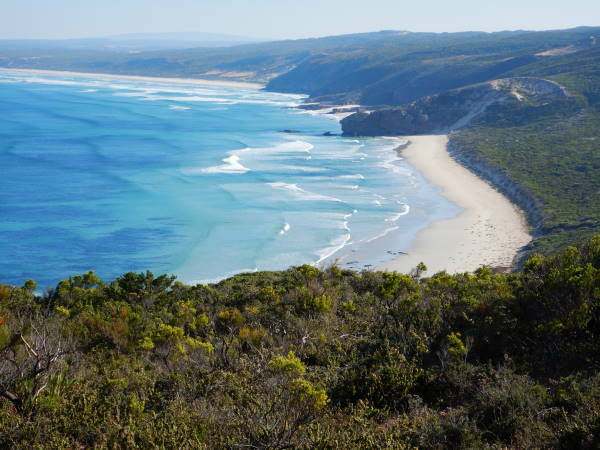 The chosen route for the day was to walk from Murrells Beach to Yellow Rock, a pleasing section of about 14km, a walk which incorporated the best of Cape Nelson’s viewpoints. Another group of walkers (led by Helen) tackled some shorter sections, including the Lighthouse, and then the Enchanted Forest. The 14km crew set off from Murrells Beach Road at about 10am, and headed for the café at the Cape Nelson Lighthouse, a little over four kilometres away, for morning coffee. Here we mixed with the glitterati of the local community, and indulged in muffins, sticky cakes and potato wedges. Continuing on from the Lighthouse, we stepped it out on the eastern side of the Cape, determined to check out the ‘enchanted forest’, the must-see that the tourist brochures talk about. 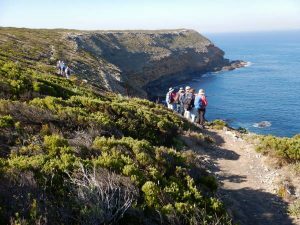 This fascinating place was encountered after about five kilometres from the Lighthouse, and proved to be a place of great ambience, with many glades of tea-tree woodland sheltered in a micro-climate on the east side of the Cape. This was the hardest walking of the day, with ‘tail-end -charlie’ reporting that this section involved a total of 328 steps to get down to the Forest, and back up to the car park (phew!!). Overall, a very enjoyable day with expansive coastal views, the amazing enchanted forest and a great bunch of walking companions. Tomorrow, we head for the ‘high-country’ – the volcanic dome of Mount Richmond.